I spent much of this morning in my wellies with Cllr Dave Smith and local Aylesford village residents who had spent the early hours putting sandbags and floodguards in front of their doors trying to prevent their properties flooding. Rochester Road and Bush Row were yet again flooded due to the ongoing problem with the stream and all before the River Medway had reached high tide. Two fire engines were on site; one was pumping water from Bush Row on to the football pitches and another from Rochester Road into a Bowser - the only one in Kent. It remains very unsatisfactory that this still happens and the sooner the alleviation programme is funded and built the better. However, the fact that (so far) the damage looks limited it does go to show that the flood plan that the residents put in place does at least work. I am sure once the waters have subsided and the warnings disappear, the local group can reassess where any gaps were and what further support they need from the authorities in the event of flooding. The top priority for me and the local Councillors now is to put pressure on those who are responsible for the alleviation schemes to hurry up and start the works. David Cameron and the team will unveil at Spring Forum the six key pledges we will be fighting the election on. The pledges demonstrate our commitment to the NHS and improving standards in education, as well as getting Britain working again. I am sure they will be well received on the doorsteps and will again show that the next election boils down to whether people want 5 more years of a bad tempered Gordon Brown who has run out of ideas or 5 years of David Cameron and a team champing at the bit to start a programme of much needed reform and change for the country. I am still working full time (the mortgage has to get paid some how) but this week I took three days off to do some meetings and visits that are impossible to do during the weekend or evenings. Wednesday was absolutely jam packed. First up was a visit to the White Road Estate Community Centre to meet with staff and volunteers. It was fantastic to hear how the infrastructure of the Community Centre has changed thanks to Council investment, and that the services being provided are being expanded for the local residents. I met the lady who runs the dance class, the husband and wife team who run the judo club, and a very passionate woman who runs the family room. They were 100% committed to their work and the support that they receive from the Council helps them enormously. I hope to get more involved in some of the events at the Community Centre in the future. After a short meeting with Medway Council Leader Rodney Chambers, I then headed over to Tonbridge for a meeting with the Inspector and Sergeant in charge of policing in the Mallings area. It was a very wide ranging discussion and it was good to come away from the Station knowing that areas like Blue Bell Hill, Aylesford, Ditton, Larkfield, Burham, Eccles, Wouldham and Snodland are being looked after by some very experienced police officers. It was then back to Snodland to discuss elderly care with a fantastic 91 year old before heading on for a coffee with a local journalist. It was then on to coaching with the girls in the freezing cold. Yesterday was comparatively light - I had a coffee morning to start with some local residents in Aylesford before catching up on constituency mail. This was followed by a chat with some youngsters at the local Youth Club who are interested in getting involved in politics before heading to my sisters in Lenham for dinner and Friends! Today was again a busy one with a visit to Aylesford Newsprint for an update on some of the local and national issues they are facing including some major legislative concerns impacting on the company. I then went along to the Robin Hood pub in Blue Bell Hill as part of the support your local campaign and ended up talking to a bunch of regulars about how angry they are at MPs for abusing their expenses. It turned out to be a less relaxing trip to the pub than I expected but it was great to engage in the classic pub politics chit chat. Then it was over to Asda for a tour of the store with the new manager before meeting some staff to listen to them about how the economic downturn is affecting them personally and their perception of the impact on their customers. It was fascinating to hear their views and I ended up keeping them off the shop floor for far longer than I am sure was meant. This post is merely to say how amazing my team are and to thank them very much for all their hard work. 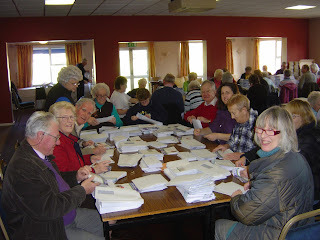 At the start of last week 60,000 letters and surveys were stuffed into envelopes, sorted into batches and dispatched to deliverers. By the end of the week 40,000 have been delivered across the whole of the constituency. Each branch had their own to patch to deliver and I picked up, with a few extra volunteers, a large chunk of Chatham and a bit of Snodland where our deliverer is unwell. The rest will be landing on doorsteps over the next few days. None of this would have been possible without a team of volunteers giving up their days and nights to work very hard towards a Conservative victory at the next General Election.